Join the Empress in her quest for the hidden treasures! Click here to play! Will you aid her in her quest and take your share of the riches? 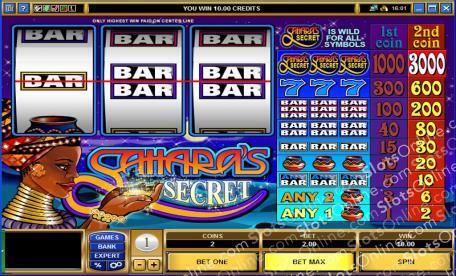 Sahara's Secret is an enchanting slot played across three reels and a single payline. There are two coins that can be played on every spin, and depending on how many you play, your winning combination payout will deviate. For example, if you win on three Sahara's Secret symbols with one coin, you will take 1000 coins for your trouble; however, if you use two coins, you will receive 3000 times your initial wager. The Sahara's Secret symbol is Wild and can be substituted for any other symbol on the reels in order to finish a winning combo. Take the journey of a lifetime as you travel across the greatest desert on Earth in search of riches. The Sahara's Secret awaits you! The Sahara's Secret is Wild and can become any other symbol on the reels to complete winning combinations.